Sandbur is an annual warm-season weed. Seed germination starts when soil temperatures reach 52 F and peaks at 75 F (Boydston, 1989). Emergence can occur until late fall if soil moisture and temperatures are adequate when viable seeds are present. This plant prefers full sun, and can reach 3 feet high. Sandbur is an annual weed that produces seeds inside of a specialized floret known as a bur. The bur protects and keeps the seeds viable for years in the soil. Rhizomes and stolons are not produced, but sandbur can develop roots at the lower nodes of the stems forming a mat, and rarely, behaves as a short-lived perennial (Gould, 1975). 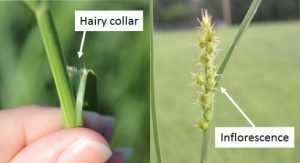 During vegetative stage, the best way to identify sandbur is looking at the leaf collar, which is the bond between the leaf blade and sheath. The sandbur collar is light-colored, hairy, and contains a membrane, i.e. ligule, that appears to have been cut by scissors into very fine strips (Figure 1). Also, the leaf blades are smooth, twisted and range from 2 to 5 inches long. The leaf sheath is loose from the stem, smooth, flattened and slightly hairy on the margins. 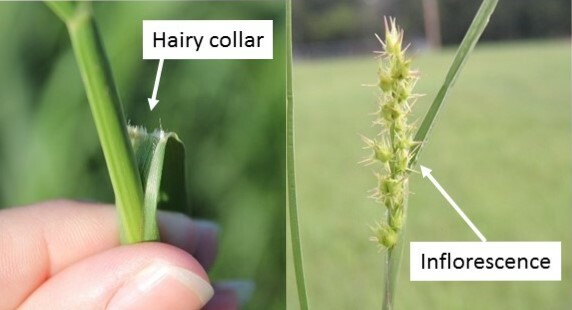 The easiest way to identify sandbur is after flowering, by looking at its inflorescence which is a terminal spike 1 to 3 inches long containing 6 to 20 spiny hairy burs (Figure 1). For effective control, sandbur must be identified and managed early in the vegetative stage to avoid seed production. The bur is what makes sandbur a successful competitor against bermudagrass. The bur not only allows the seed to stay viable for years in the soil, but also absorbs and retains soil moisture until conditions are good for germination. In this way, sandbur can easily take over poorly managed bermudagrass pastures on dry sandy soils. The best control is prevention (Table 1). However, some pastures are already infested. In this case, the second alternative is cultural suppression. Good management practices consistently used every year will continuously decrease sandbur and increase bermudagrass yields. The last resource is herbicide application that should be used in severe pasture infestation and in combination with cultural suppression techniques. Table 1. Chemical control products labeled for sandbur control in bermudagrass pasture and hay. During bermudagrass pasture establishment, sandbur infestation can be prevented by using certified seed or sprigs, which ensure strict limits on weeds. For subsequent years, it is recommended to inspect and clear equipment, animals and clothes that were previously in other pastures infested with sandbur. The spiny burs can easily attach to them and rapidly infest the next pasture. Hays can also contain and spread sandbur. Avoid introducing hay to your pasture that was produced in fields infested with sandbur. If purchasing hay, it is recommended that you inspect the hay and inquire about sandbur prior to purchase. For more information regarding hay inspection, see factsheet PSS-2588 Evaluating Hay Quality Based on Sight, Smell and Feel – Hay Judging. Proper fertilization and stocking rate combined are the best sandbur control in bermudagrass pastures. Proper fertilization will provide all nutrients, while proper stocking rate will assure enough energy reserves for fast and vigorous bermudagrass regrowth. Following these measures will not only make bermudagrass more competitive against sandbur, but they will also increase the pasture productivity and quality. As a rule of thumb, it is recommended applying 50 pounds of nitrogen from May to October for every one ton of bermudagrass forage production. Soil phosphorus and potassium should be maintained in good levels for good root development and plant regrowth. See Fact Sheet PSS-2263 Fertilizing bermudagrass Hay and the Oklahoma Pasture Fertility Guide for more information regarding proper bermudagrass fertilization. Proper stocking rate can be achieved by monitoring available bermudagrass forage. Keep in mind that 2 to 3 inches stubble height is essential for good bermudagrass regrowth and sandbur suppression. Bermudagrass is well known to tolerate heavy grazing. However, heavy grazing decreases bermudagrass yield and increases weed pressure in pastures. Focus on achieving optimum yields by keeping 2 to 3 inches stubble height whether cutting for hay or grazing. Fact Sheets PSS-2594 Plan Grazing Management Using the Oklahoman Grazing Stick and PSS-2871 Pasture and Stocking Rate: The Key to Successful Livestock Production contain information on proper forage availability and stocking rate estimation. Pasture burning can reduce sandbur populations if executed at the right time and intensity. Conversely, burning may stimulate sandbur germination if it is not intense enough to kill the seed and the remaining soil cover is low. In this case, burning can increase herbicide efficacy because a high percentage of sandbur seeds will germinate and will be exposed to the applied herbicide. Chemical products for sandbur control are limited and do not differentiate between sandbur species. Currently only four products are labeled for sandbur control or suppression in bermudagrass pasture. They are glyphosate (many formulations), Plateau, Pastora and pendimethalin (many formulations). MSMA is no longer available for use in bermudagrass pasture. Use rates, timing and potential yield losses are presented in Table 2. In 2014 and 2015, research at Oklahoma State University indicated that both Plateau and Pastora controlled sandbur best at 90 and 100 percent, respectively, when applied within three weeks after germination. After three weeks of age, only Pastora adequately controlled sandbur. These two products also limit yield losses compared to glyphosate treatments. While the glyphosate treatment is much cheaper than Pastora or Plateau, yield losses are much higher. Table 2. Summary of best management practices (BMPs) to control sandbur and recover bermudagrass pastures. The gray cells indicate optimum timing of each BMP through the year. If sandbur is a concern for your pastures, it is best to take a multi-faceted approach to control. Make sure stocking rates are suitable for the productivity of the land and implement management strategies including appropriate fertility, periodic burning where allowed and only use chemical weed control where yield losses can be tolerated for a season. Boydston, Rick A. (Jan, 1989). Germination and Emergence of Longspine Sandbur (Cenchrus longispinus). Weed Science 37 (pp 63-67). Weed Science Society of America and Allen Press. PSS-2588 Evaluating Hay Quality Based on Sight, Smell and Fell – Hay Judging. PSS-2871 Stocking rate: The Key to Successful Livestock Production. PSS-2594 Plan Grazing management using the Oklahoman grazing stick.